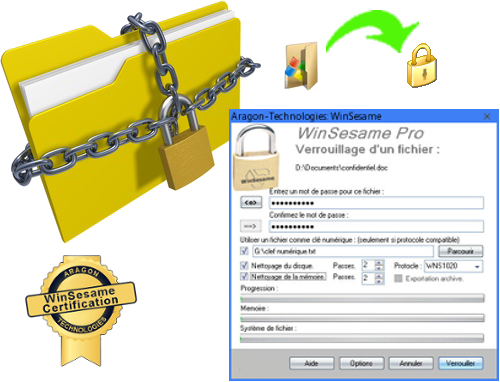 YES: A protected WinSesame file or folder can get carried away as a file and it is even possible to send it as an attachment to a email message. If you need to open this file on a computer where the program is not installed, you should simply check the "Exportation archive" checkbox. In this case the WinSesame decoder will be encapsulated in the encrypted archive which will then have the .exe extension. To open this file, simply double-click on it. The WinSesame decoder window opens and you or your correspondent can enter the password to open this file or folder. Nothing will be installed on the computer.